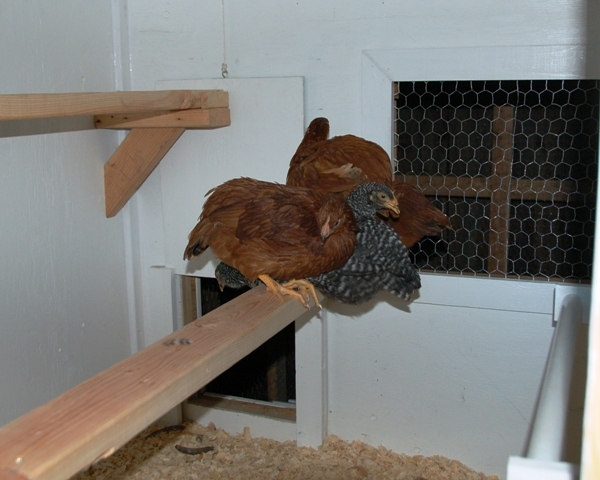 First off, if you follow me on Facebook or twitter you may have seen that I failed miserably in my attempt to get the chickens out of the house before I left for the conference -- I was so, so close but it was not to be. Sadness factor 10. My hands looked like they belonged to an old man lumberjack because gloves are for sissies (or people who remember to put them on -- a group that I do not belong to) and my tender little spirit was crushed. Happily though, my rockstar husband finished it all up and moved the poultry outside to their new home the first day I was gone, and so I came home to a happy new world. Chickens, outside! Where they belong! Today was a beautiful day. Please understand, the coop is not complete -- heavens no. 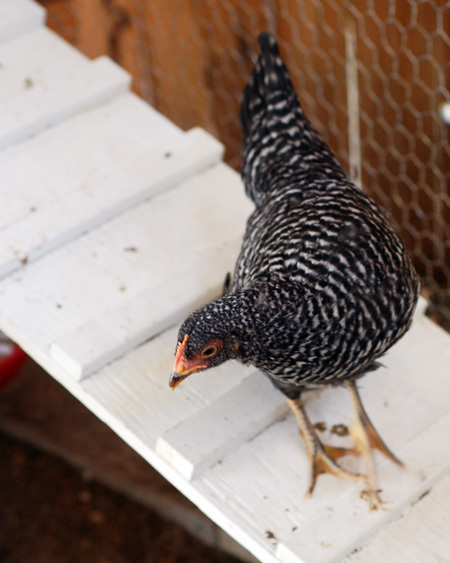 There are several finishing touches like trim we need to add before I spring for a fancy reveal of our chicken cottage... so in the meantime let's tackle some questions. I'm like a less experienced, less read, less human-centered version of Dear Abby. Q: Did you use plans or did you just wing it [the coop]? Are you going to share/sell the plans? A: We didn't use plans, but we did use a couple coop posts we found as inspiration. 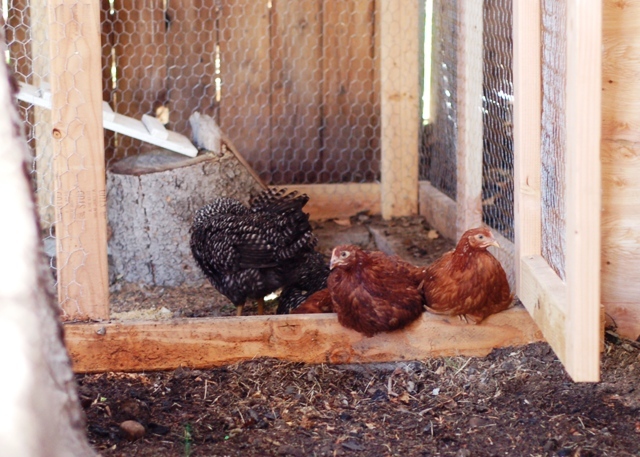 Probably the biggest inspiration for a lot of the details was this post I found on Backyard Chickens. So no plans to sell a plan as we made it up as we went along, but I'd be happy to share general measurements or any details like that if anybody is interested! Q: I'm wondering how much of a pain they [the chickens] will be to take care of in the winter? A: Well I can't speak from experience yet, but we chose to leave food in the coop at all times with a feeder than can hold 11 pounds of food at a time so we won't have to slog out in the snow twice a day to feed the birds, which sounds like a recipe for chicken soup if there ever was on in my little world. As far as water, the coop post I link to in the last question also has a smart little idea for keeping water from freezing in the winter that we might try -- it involves bricks and a light bulb and we'll see... if you can avoid running electricity to a coop it seems safer, as it's a fire risk, but this set up seemed pretty smart and safe. Lastly, as far as snow and cold weather goes, the coop is insulated (yes, we took that extra step) because the chickens are like pets (sort of) and I wanted them to be as comfortable as possible in the winter even though they're cold hardy breeds. The run also has a roof over it and it's in an area that's well protected from wind so there shouldn't be snow accumulations in there and if they feel up to it, they can have a place to run around if they venture out... but I'm not sure how much they will. We'll just have to see! Q: I'm thinking about raising chickens now! Do you have any advice for me? A: Yes; read up! We checked out several books from the library on raising chicks and bought Storey's Guide to Raising Chickens which has a ton of useful information in it. The biggest help though has probably been Backyard Chickens and their forums, the library of amazing coop photos and the fabulous articles. I've spent way more time on that site stalking old forums and searching for answers than I care to admit! I'm now pretty much a chicken expert. Okay, that's not true at all; but I'm at least semi-confident that we've done a good job providing for our chickens' basic needs and that we can handle what crazy chicken antics are still to come, now that I know that insane creatures like chicken snakes don't live in Idaho. Seriously, if I lived on the other side of the US I would not be raising chickens. I am the world's biggest wuss and snakes send me over the edge. 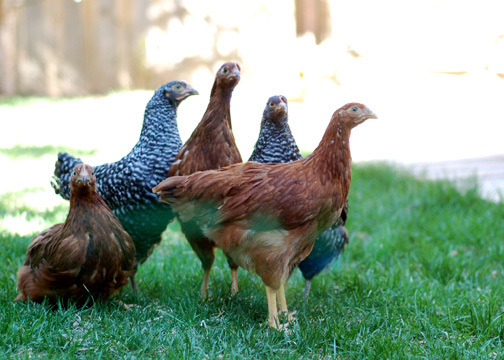 Q: Are you going to turn your blog into a chicken blog?? A: Ha. No -- I like 'em, but I don't like 'em that much! Gleaming all your chicken IQ! Seriously thinking about turning old playhouse into stylish chicken dwelling. As for chicken snakes--I live in Texas and yep, not a creature you want to encounter as you're collecting eggs. My 11 yr old daughter had a nest of baby birds in the tree above her tree house. One day a chicken snake had a baby bird feast. Her dad saw it and shot the snake. And my (future veterinarian?) daughter very carefully dissected it (baby birds and all) with her father's pocket knife. Appreciate the key article! I usually make use of the service https://www.slideshare.net/edubirdie in order to save time and then talk about everything. They always follow my instructions. And every article unique. I suggest the resource to each student and bloggers.